Sophie: It's so good to be back. We've all missed you guys! Natasha: That's so true. Well, not all of you. I have my favorites. And don't let Sophie fool you. She has favorites, too, like that Kelsey Haberman. Sophie: It's just that I don't think she killed her husband. Natasha: Are you kidding? It's so obvious. Everyone knows she murdered him for his money. Sophie: If you knew her better . . .
Natasha: Please, she doesn't have the best reputation around town. Sophie: People can be a little bit catty. Natasha: Can you blame them? Sophie: She's really a very nice person. Natasha: I'll decide that for myself. Oops! I've made up my mind. Sophie: That's the problem. Everyone is jumping to conclusions about her. What happened to giving people a chance? Natasha: I really don't like it when you try to make yourself out to be so caring. Oh my! You're trying to bait me. You're trying to make me feel guilty just to get me to side with you. Well, Sophie, you're fighting a losing battle this time. You know, just because you like someone doesn't mean she's not a killer. Sophie: And just because people haven't gotten to know her doesn't mean she murdered Hollis. What do you think? Do we jump to conclusions about people we don't really know? Krista is letting us give away a copy of COLOR ME MURDER, the book with cover that you can color. Leave a comment with your email address to enter. There is nothing quite as powerful for dissolving prejudices as getting to actual meeting and know the person. I'm glad you're Baaaack-Sophie. This should be a fun book. Can't wait to read "The Diva Cooks Up A Storm". Great series. Can't wait for May 29th. Missing Sophie and even Natasha! So happy this is finally coming out. Can't wait to read it. Those gals! How many books in the series? I have some time to catch up! A cover to color...doesn’t get much more fun than that. Thanks lldawnjm@gmail (dot) com. 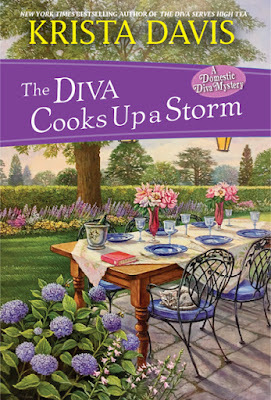 Absolutely LOVE the cover of "The Diva Cooks Up A Storm"! Hydrangeas are my favorite flower because they remind me of my Granny. In fact, I called the Granny's flowers until I finally as an adult found out the proper name. One flower could be a whole bouquet leaving all the rest to make the garden so pretty. And purple was our daughter's favorite color. As a little one she called it burple. :) Can't wait for the chance to read this book. Missed these ladies. Glad to see you are coming back with them. Looking forward to reading it. I love Krista Davis's books. Thanks for the opportunity to enter the giveaway. I enjoyed the peek for this book. I love this series and can't wait until next month. Also thanks for the chance to win. I TRY not to jump to conclusions. It doesn't always work out, though.